There is no question that 12" quilt blocks are the most commonly used. But at times, you want to make a block that is a little smaller and uses easy math. Enter the 9 inch block -- not too big and not too small, but just fits the bill. Who has not heard of the Underground Railroad? Well if not, a brief history is that it was not a train at all, but a secret network of people who assisted slaves during the 19th century to escape from the southern states, staying in secret and hidden "safe houses" on the way. The slaves followed the north star to northern states and Canada where freedom awaited. 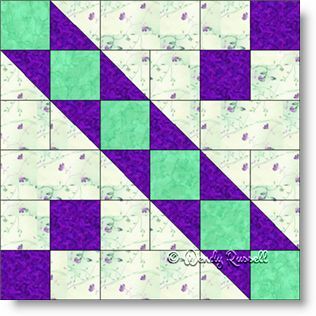 The sample quilts illustrated show how secondary patterns can emerge with just this one block, by using simple 90 degree rotations. What interesting arrangements can you come up with?